Scenario 1: Remote VPN fails with error: "Site is not responding" or "Gateway not responding"
There are quite a number of scenarios, in which you may encounter "site is not responding" issues. The scenarios that we have encountered and dealt with are detailed below. Remote VPN fails with error: "Site is not responding" or "Gateway not responding"
Trying to view the certificate gives the error: "Failed to read certificate from database"
VPN debug shows issues with connections to the gateway over TLS. VPN certificate is expired / does not have the right properties / is corrupted. Backup the database by using Database Revision Control. Select 'File > Database Revision Control > Create'. Remove the Gateway Object from any VPN community it participates in. Select 'SmartDashboard > Security Gateway / Cluster object > Properties'. Select "IPSec VPN" and under 'Repository of Certificates Available on the Gateway', select the certificate called 'defaultCert'. Click on 'Remove' > confirm. Click 'OK' to close the 'Properties' window. Save all changes. In 'File' menu, click 'Save'. Select 'SmartDashboard > Security Gateway / Cluster object > Properties'. Select "IPSec VPN" and under 'Repository of Certificates Available on the Gateway', click 'Add...'. In 'Certificate Nickname', type defaultCert (all letters are small, except the 'C'). Click on 'Generate...'. Click 'OK' to close the 'Properties' window. Save all changes. In 'File' menu, click 'Save'. Put the Gateway Object back into any relevant VPN communities. Install policy on the Security Gateway / Cluster object. Endpoint Security VPN fails to connect to Security Gateway with "Site is not responding" error. Security Gateway segments packets to 1500 bytes according to the MTU of its interface. Security Gateway sends packets with "Don't Fragment" (DF) flag set. When the Security Gateway sends packets that are larger than the next hop's MTU size, receive an ICMP "Fragmentation Needed" message with the next hop's MTU size. Next hop MTU is less than the MTU of the external interface of the Security Gateway. As a result, the next hop drops the packets since they are sent with "Don't Fragment" (DF) flag set. On the Security Gateway, lower the external interface's MTU size to the next hop's MTU size. Note: There is no impact on the environment, as the traffic should be sent according to the next hop's MTU size, anyway. It is a best practice in general to configure the same MTU on the external interface of the Security Gateway as the MTU of the next hop router. sk96124 - Path MTU Discovery (PMTUD) issues with Check Point Active Streaming (CPAS). If Visitor Mode port is changed from default (443) to something else, Endpoint Security VPN cannot establish site if it uses only the Security Gateway IP address. Site can be established if IP address:port is used. Customer upgraded the firewalls to R77.20 from R75.45. Then realized that their vpn clients could not connect to the gateway anymore. Clients get the following error: "Error: Connection Failed: Site is not responding. You might be in hotspot environment." Site to site VPN tunnels are working fine. In Smartview Tracker, can see the relevant connection being accepted, as expected, and on the correct port (1720). fw ctl zdebug drop shows no drops for this connection. [vpnd 9015 2012542656][28 Aug 10:58:03] async_mux_data_handler: Connection is of type TCPT. Where 1720 is the changed visitor mode port. Check Point recommends to always upgrade to the most recent version (upgrade Security Gateway). For other versions, Check Point can supply a Hotfix. Contact Check Point Support to get a Hotfix for this issue. The real issue is the changed Visitor Mode port. Changing the port should be done ONLY if really needed. In that case, site should be created with this port, i.e. site can be established if IP address:port is used. "Failed to create the new site. Site is not responding." error when Remote Access users are trying to establish a Site with SmartLSM Security Profile (that belongs to a Remote Access IPsec VPN community). SmartLSM Profile cannot be part of a Remote Access IPsec VPN community. Neither Remote Access, nor Office Mode are supported by SmartLSM Profile. These features are not included in the product. If you need it, please submit a Request for Enhancement. [PID][DATE TIME][tunnel] IkeTunnel::SchedSendTunnelTestPkt: No tunnel test reply from GW. Cannot reconnect. By design, the VPND process is in charge of the reply to tunnel test packets (UDP 18234). Due to the load, the VPND resources are busy, and it fails to reply to the tunnel test packets, thus causing the Client to not receive a reply for the tunnel test, and disconnect. On Security Gateway, set the value of the kernel parameter tunnel_test_do_in_kernel to "1"
The change will cause the FW Kernel to process the tunnel test packets instead of VPND. "Site is not responding" is displayed by the Endpoint Security Client while trying to create a new VPN Site. Endpoint Client can create site with SecureClient R60, but not with Endpoint Security Client E75.30, or E80.50. Changing the Platform Portal in SmartDashboard is not possible. If you change the Portal port, then you are unable to close the window ("OK" button is not responding). Entire MultiPortal infrastructure (portals object) was not created for any new Security Gateway. 'portals' attribute determines configuration of each Portal in MultiPortals configuration, including certificate to present to the client. Get an export of the Security Management/DMS using Check Point Migration Tool. Rebuild the Security Management Server / Domain Management Server, and import the database using the Check Point Migration Tool. Create the new Domain Management Server. Select "Import Data" and specify the location of <File_Name>.tgz during the CMA creation. [ 3136 3212][5 Jan 10:27:07][talkhttps] ATalkHttps::CloseConn: Close SSL conn: 0 State 0x6 Reason: Termination. Traffic capture shows that the SSL negotiation was initiated by the client (Client HELLO) and received by the gateway. However, the gateway does not reply with 'server HELLO'. Remove the gateway from all VPN communities. For more information, refer to VPN R77 Versions Administration Guide. [talkhttps] ResetRcvBuffer: data 00000000 size 0  free_buffer=1. While creating a VPN Site, the initial traffic sent by the Client to the VPN Gateway will be HTTPS traffic. The VPN Site creation will fail if Visitor Mode is either disabled, or not configured for HTTPS service. In SmartDashboard, open the relevant Security Gateway / Cluster object. Expand the VPN Clients - click on "Remote Access". Select the "Support Visitor Mode" checkbox. In the "Service" field, select "https". In the "Machine's Interface" field, select "All Interfaces". Install the network security policy on the Security Gateway / Cluster object. Endpoint Security VPN fails to connect, and the following error appears on the client side: Site is not responding. No information is listed in VPND.elg for the failed SSL negotiation and "ClientHello: start parsing" cannot be found. The free space in the kernel buffer for conducting the Trap is smaller than the Trap message size. Remote Access Client on Mac cannot connect after disabling RC4 and 3DES cipher suites. "SSL routines:SSL23_GET_SERVER_HELLO:sslv3 alert handshake failure"
Mac Clients only offer RC4 and 3DES during the SSL handshake. Consequently, the SSL handshake fails, as no other Cipher suites (AES128,AES256,etc..) are proposed. Check Point recommends to always upgrade to the most recent version (upgrade Remote Access (VPN) / Endpoint Security Clients). For other versions, Check Point can supply a Hotfix. Contact Check Point Support to get a Hotfix version of Endpoint Security Client for MAC. "Site is not responding" message in Remote Access client GUI when connecting to Locally Managed 600/1100/1200R appliance. 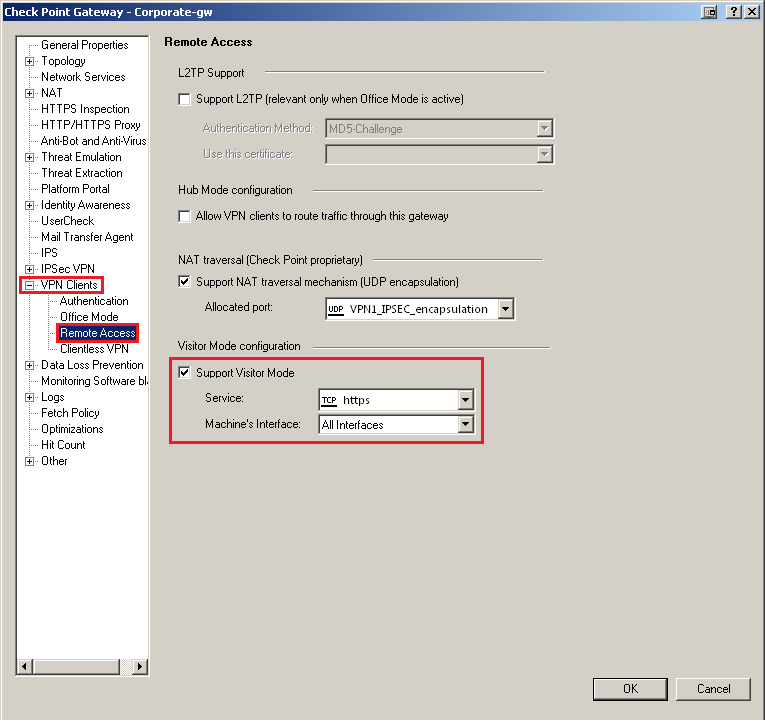 Remote Access port on Locally Managed 600/1100/1200R appliance is set to a port other than TCP 443. Login to the WebUI of the Locally Managed 600/1100/1200R appliance. Go to "Device" tab - click on "Advanced Settings". Edit the attribute and set the port to "443"
Endpoint Security Remote Access VPN client fails to create a VPN site with the error "Site is not responding"
Packet captures show the IP Address of the VPN client communicating on port 80 or port 443 instead of on the configured port intended for VPN. The Check Point 600 / 700 / 1100 appliance has stopped associating the VPN client port 80/443 traffic as being related to the VPN client, and has begun treating the port 80/443 traffic as though it was normal HTTP/HTTPS traffic. This may include the traffic being blocked, or port forwarded to internal servers.